Saturn's moon Mimas appears near Saturn, dwarfed by its parent planet in this image. Mimas (246 miles, or 396 kilometers across) appears tiny compared to the storms clearly visible in far northern and southern hemispheres of Saturn. The image was taken with the Cassini spacecraft wide-angle camera on Aug. 20, 2012. A jaw-dropping picture of the planet Saturn was recently released by NASA's Cassini probe orbiting the ringed giant. 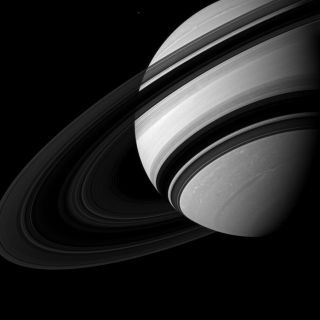 The black-and-white photo shows the gas giant tilted, with its iconic rings draping striking shadows against the planet's atmosphere. A faint dot in the top middle of the image, which you might be forgiven for thinking was a speck on your monitor, is actually Saturn's moon Mimas. The moon, at 246 miles (396 kilometers) across, is dwarfed by its much larger parent. When seen up close, Mimas is dominated by a giant crater on one side that gives it a strong resemblance to the Death Star in the "Star Wars" films. The darker dapples along Saturn's face are violent storms that rage in the planet's hydrogen and helium atmosphere, researchers said. Cassini's view of Saturn looks up at the unilluminated side of its rings from an angle of about 18 degrees below the ring plane. The north side of the planet itself is up and rotated 27 degrees to the left. Cassini launched in 1997 along with the Huygens lander. Cassini arrived at Saturn in 2004 and dropped Huygens onto the surface of Saturn's huge moon Titan in January 2005. The Cassini-Huygens mission is a joint project of NASA, the European Space Agency and the Italian Space Agency. Just last month, Cassini celebrated the 15th anniversary of its launch, and it has logged more than 3.8 billion miles (6.1 billion km) during its time in space. The probe has taken more than 300,000 images of the Saturnian system, which includes the ringed planet and its more than 60 known moons.